On Thursday 29th of September join award winning beer writer Matthew Curtis for an eclectic tasting through six different beers as he once again brings his bi-weekly Hop Burns & Black column, No More Heroes, to a live audience. 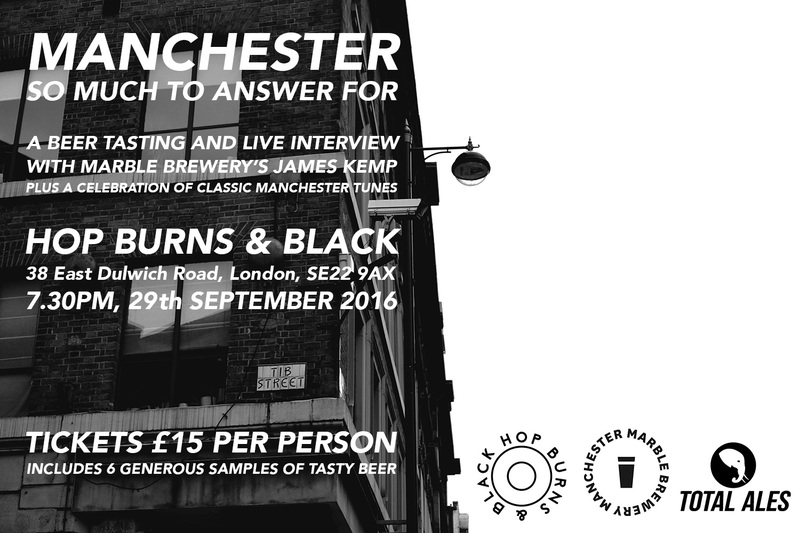 This time our beery theme is Manchester, and so Hop Burns & Black founders Jen Ferguson and Glenn Williams will be spinning some classic Manchester tracks between each beer. We’re also very pleased to welcome James Kemp, head brewer of Manchester’s iconic Marble Brewery as our very special guest. We’ll be recording a live interview with James as he leads us through a tasting of three Marble beers, before picking three of his favourites from the HB&B shelves for lucky ticket holders to taste. If you’re heading down make sure you come armed with questions for James, who’s currently helping to reshape the direction that Marble are heading in through an increasingly varied range of vibrant and tasty new beers. With the Independent Manchester Beer Convention right around the corner there’s no better time to celebrate some of the wonderful brewing happening in one of our favourite cities, so we hope you’ll join us for what promises to be a seriously fun evening. Tickets are just £15 (plus booking fee) and are available via TicketSource here. Each ticket includes six generous samples of beer. We kindly request that ticket holders arrive by 7pm so that the event can begin promptly at 7.30pm.